Have you been to Cafe My House? Back in May, the NCVA was excited and intrigued to find the word “vegan” appear on the sign of a cafe in Ottawa’s South end. It was for Cafe My House, and thanks in part to the NCVA’s promotion, word has spread like wildfire about this little cafe, where the menu is about 75 per cent vegan and where even raw foodists and gluten-intolerant people can find a good meal. And did we mention it’s mostly vegan? Cafe My House's "Healthy Me" vegan brunch platter. Side of potatoes is optional. I had heard rumblings about a new vegan-friendly restaurant on Bank Street and I had to try it myself. Check it out, even the sign prominently declares its animal friendly nature. Needless to say, I was excited. Cafe My House is reincarnated from its previous (more) east end location and is a family owned business that appears to focus on healthy food. While there are a couple of meat options, there are approximately twenty choices on the menu that are vegan and that does not include sides, drinks or extensive smoothie list. Impressive, to say the least. Breakfast boasts vegan versions of the usual options like pancakes, french toast and (tofu) scramble while also including the intriguing Moroccan Quinoa Pilaf. 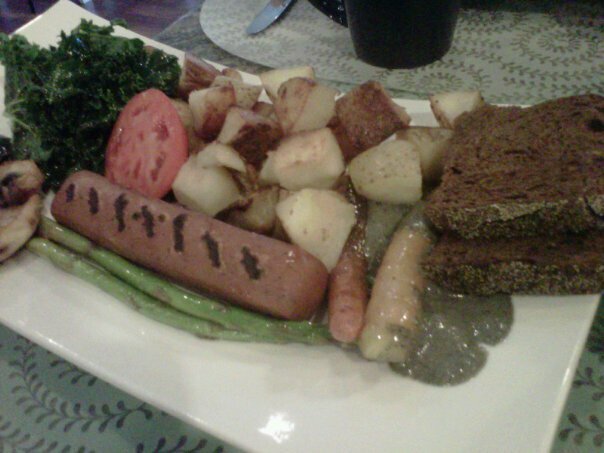 Vegan breakfast sans oatmeal is hard to come by in Ottawa restaurants so Cafe My House is a welcome sight for hungry brunching vegans. I didn’t eat breakfast during my visit but that just means I have an excuse to go back. Lunch looks promising too. They have a few different soups, salads and sandwiches as well as tasty sounding starters they call “House Bites.” I’ll probably try the quesadilla or the mango-zucchini roll next time I stop by for lunch. Finally the main courses. I had a lot of trouble deciding what I wanted and who wouldn’t with choices like Creamy Sesame Soba Noodles, Earthy Vegetable Curry and Tofu Mushroom Steak. In the end, after a recommendation from the friendly server, I chose Vegetarian BiBim-Bop. What now? This was a tasty Korean rice dish topped with a variety of delicious sautéed vegetables and nori all covered with a spicy chili sauce. I ended up asking for extra chili sauce because I like things with a lot of heat and flavour and the extra kick made for an excellent dish. What about dessert? Of course I couldn’t pass up the vegan dessert of the day, a black bean hazelnut brownie. The brownie was fudgy and dense and not too sweet, pairing nicely with the light warm fudge sauce poured liberally over top for a lovely presentation. Decadent. But don’t take my word for it. Make your way down to 1729 Bank Street, just south of Heron, and try out Ottawa’s newest vegan friendly restaurant for yourself. I dare say you won’t be disappointed. My partner and I went for brunch a few months ago. We had the stuffed french toast and one of the tofu scrambles. The french toast was madly decadent and delicious. Stuffed with bananas and (I think) coconut in the same manner as the Imperial’s vegan pancakes. The outside was crispy enough to make me suspect deep frying, a possibility I pondered guiltily for about 5 seconds before digging in. The scramble was also very nice…I’ve had tofu scrambles at Veg Out (London, On), Sadie’s Diner (Toronto), The Cornerstone (Guelph), and Joseph’s (Woodstock, NY)…oh, and one on an Air Canada flight. While my partner’s homemade one still beats all, I’d say Cafe My House comes in at a solid second. We haven’t made it back since it’s a bit out of our way…but reading and reminiscing on how good it was, I think we’re going to try out the lunch or dinner menu soon. I have been to Cafe My House twice … and I don’t even live in Ottawa! It is a must-stop when I am visiting friends in the Ottawa area. The first time I got the healthy breakfast with sausage, so that I could see what properly cooked kale is meant to taste like. It was delicious. The second time I ordered several things for take-away and they were all delicious. This is a fantastic vegan spot. I hope everyone will give it a try – they need the business and the support of local vegans and vegetarians!